Samson you are adorable and welcome to floof and fur. I will see you over there. That is cool! Congradulations on becoming a Floof and Fur member! I will be over there too! It's dreadfully hot here too. So glad we are kitties on the inside where it's cool! Concats on becoming members of the Floof and Fur! We are going to go over and read your post! Our dad has not put in our window air conditioner yet, so we know how you feel! And mom says there is no way she can carry it down from the attic herself - we think she should at least try. We really liked your Floof and Fur post, and your little sidebar badges. Congratulations! Samson, we would last 2 minutes living here without air conditioning! Ack! It's hot work being gorgeous Samson. A bowl of ice infront of the fan helps when there is no AC! Samson I can only imagine how hot it must be for you in that thick fur coat of yours! Hope the ball guy gets on the ball and installs your A/C toute de suite! I'm off to look at your Floof n Fur piece now. Welcome to the club. Dante belongs too. Samson, you look so handsome in that box. With all that floof, we can see why you'd need the A/C! Samson...we hope the A/C gets hooked up soon...we wouldn't want to see you sweat!! Hope your A/C gets hooked up soon, we'd never survive without it in Texas and we don't even have the floof you do! We hope you don't melt away with no a/c. 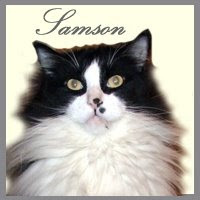 Your new badge looks so neat, Samson! If it helps, it's hotter than Hades here, too:( Luckily, our AC is working fine. You are a hottie Samson, but I'm sorry for that today. You are just so cool, Samson!